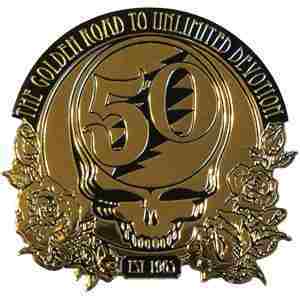 Celebrate the golden anniversary of the Grateful Dead with this gold colored heavy duty metal sticker of the official 50th Anniversary logo. This golden sticker is now available in 2 sizes. Small size measures approximately 2" big and the large sticker is approximately 4" big. Officially licensed Grateful Dead merchandise.